A recent conversation about pairing wines with pies (it’s the logical follow-on to Halloween candy pairings, and yes, that comes up every year) got me thinking. The truth is, I personally wouldn’t pair wine with pie; pie is clearly a coffee situation. But if you want to play the pairing game and you like a challenge, sure. Entry-level: everything goes with champagne. Beyond that, apple pie is easy; lots of dry whites have apple notes (pinot blanc almost always does, chardonnay frequently does if it’s not over-tropicalized, and Roussanne has a nice blend of orchard fruit notes). Pumpkin pie is unctuous and spicy and might like to hang out with something a little sweet, maybe even a raisiny late-harvest red and almost certainly a ripe Chenin Blanc. Pecan people should probably give up and go with bourbon, but something dry and low tannin is the best bet (dolcetto would work). Then a friend caught me bragging about my pie-crafting chops and demanded a demonstration, only she wanted blueberry. I said blueberries were not a fall fruit. She said we live in California where everything is an all-year fruit. I said only a transplant from the Midwest would say that. If you’re wondering if this argument is about to get interesting, the answer’s “no,” but I did start thinking about the wine equivalents of blueberry pie. Which is not to say I will be making one for my friend unless she wants to wait until May because I am not backing down on that. In tasting notes, references to very sweet things like pie or candy can program people to expect sugary wine, and that’s usually not the deal, so if you are allergic to residual sugar don’t be put off by dessert terminology. A dry wine can easily express crème brulee (chardonnay), cherry pie (syrah), passionfruit syrup (New Zealand Pinot grigio) or Cherry Coke (California Pinot Noir). So, when I say “blueberry pie” I am not saying “sugar bomb.” I am saying if you like dense blue-fruit notes in a wine seek out the out-of-fashion Rhone also-ran Petite Sirah (or Durif) and the northeastern Italian oddball Lagrein (now being made quite well in Oregon). Lagrein is a very old varietal native to (and largely confined to) Northeastern Italy. 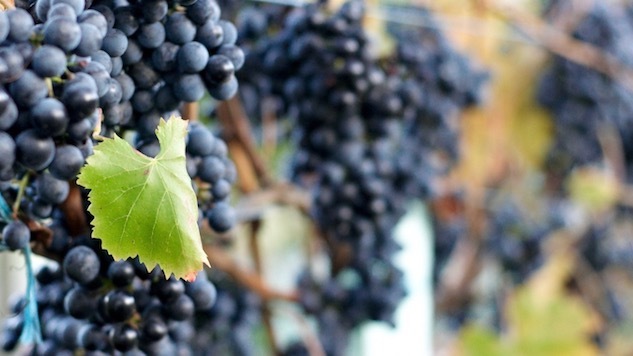 Petite Sirah is a Rhone Valley grape most commonly found in California these days. These grapes are not close kin as far as I am aware, but they share a wintry stick-to-your-ribs quality, a dense texture, heavy body, assertive tannin structure and a flavor profile that favors dried or stewed blueberries, figs, plums or prunes, and brooding peppery spice. Both are inky, deep purple wines (I think only Tannat and Sagrantino can touch these guys on the color saturation front, so if you are someone who drinks red wine for the anti-oxidants, this is your grape). They share a profound and substantial mid-palate; Lagrein tends to have a longer finish than Petite Sirah. Lagrein is more acidic than Petite Sirah (in fact in Central CA they are sometimes blended to average that out). They are rich, satisfying wines that feel good in cold weather the way Provencal rosé feels good in hot weather. And because they are not trendy, they are usually great values (the occasional exalted exceptions are mostly worth it for a once in a while splurge, they’re really, really good). Good Petite Sirah is largely going to come from Northern California, especially warm zones like Napa (expensive) and Lodi (poets can afford it). Lagrein will almost always come from Alto Adige-Trentino on the Italy-Austria border; it is also seen in New Zealand and increasingly in Oregon. In my neck of the woods this is the Lagrein you are most likely to stumble across in a supermarket. Deep red in the glass, spiced plum nose. There’s a strong “animal” character to this wine but it’s “meaty” versus the “barnyard” note found in wines influenced by Brettanomyces spores. Its dominant flavor notes are blackberry, blueberry, plum and pepper. If you like game, this is a wine to consider, because it does too. Lagrein is starting to get a foothold in Oregon, and in particular the Umpqua Valley in the southern half of the state. Brandborg seems to be handling the translation pretty well. This is a lovely wine with identifiable “varietal typicity” but influenced by the terroir of the Northwest. Deep, dark hue, tannins in the “mouthfilling” zone, aromatics and flavors ranging from wild blueberry to black currant, plus exotic spice notes (pink pepper, cardamom, clove). There are sub-notes of coffee and cherry pie (Special Agent Dale Cooper would probably give this a thumbs up.) You might have to track it down online, but it’s well worth doing. This is the wine that made me fall in love with this varietal when an exasperated enoteca manager redirected me away from the Brunello I thought I wanted. Inky, almost thick (you’d call it “viscous” except the cutting acidity prevents that). The aromatics are as saturated as the color: blueberry, fig, marble dust, black cherry, vanilla, coffee, cloves. Minerality consistent with the region’s porphyry bedrock; it really does taste like marble. It’s structured, supple, and densely layered, the kind of wine you can sit with all on its own and just let it unfold. Open it in a situation where you can share it… but not with too many people. Garnet with violet reflexes and a spicy bouquet. This wine is on the rustic side, and relatively youthful for a varietal that’s often a bit more of a grown-up. Berries (like, all the berries) and spices (allspice and pepper dominating) combine with cacao nibs on the palate. Full-bodied but not heavy. I’d pair this with anything featuring wild mushrooms. This is a warm climate varietal you don’t often see coming from Pinot country, but it works. Herbaceous nose (violets, juniper berries), layered palate featuring blackberry, blueberry, dark cherry and coffee. Study structure, smooth tannins, long finish. A meat-loving wine, but I’m sure it can be flexible. Hard goat cheeses or gruyere would be friendly companions. Velvety and dark, with an especially pronounced violet note. Fruit profile favors blackberry more than blueberry but both are present. Has a pleasantly bitter edge to the finish. Excellent with venison if that happens to be your thing. Excellent with all kind of other things if not. Purple. Earthy, intense nose with notes ranging from anise and chocolate to leather and grilled meat. Palate favors blueberry, blackberry, cherry, vanilla, earth, a trace of menthol. This wine is happy when it gets some air time before drinking. Tannins are intense… honestly the whole wine is intense and if you don’t dig that you probably want to find a different one. If you love serious, serious full-bodied reds, though, this is a treat. Dark, brooding, slightly melancholy; this is a wine for channeling your inner Romantic poet… although your inner office job guy will need to pay for it. Definitely an experience as much as a beverage. The operative word is “concentrated.” California winemaking has tended to favor a “maximalist” approach of high extraction, edge-pushing ripeness and obsessive oaking with many varietals that arguably do better with less. The thing about Petite Sirah is that it’s a “lean in” kind of grape that way; its best expressions are a bit over the top and you don’t have to be Vino-Voldemort to get them into that zone. Case in point. Gustafson is a voluptuous, Rubenesque but well-proportioned wine with decadent, layered fruitiness balanced with “big-boned” structure and firm acidity. Dense aromatics favoring dark wild berries and milk chocolate, inky stewed-berry palate with traces of lavender and pepper. Structure for miles. If you’re looking for an “entry-level” Petite Sirah, this is a good choice. It’s full-bodied but pretty soft, structured but not forbidding, rich without being overwhelming. Fruit-forward and sporting the varietal’s distinct opaque purple color, this is a dry wine that nonetheless leads with a lot of “sugary” notes (caramel, butterscotch, chocolate) as well as a black cherry compote sort of quality. The more savory elements you get in some petite sirahs (earth, leather, meat) are not especially present in this one so those who find that stuff unduly challenging will be spared having to contend with them. And you cannot beat the price (thank you, unsexy Lodi ZIP code). Mendocino is not a place you associate with this varietal, and indeed it is a slightly atypical version of the grape, but not by any means in a bad way. If you like the idea of Petite Sirah but wish it would just lighten up keep an eye out for this one. Rose and violet florals dominate the bouquet, the hallmark wild blueberry note claims the midpalate, and the tannins are firm rather than “chewy.” Don’t mistake me, this is very much still a full-bodied wine. It’s just not as much of a knockout punch as some of its warmer climate brethren.